I am literally shocked that not ONE Greek recipe has appeared on this blog yet. Why am I so shocked? It happens to be one of my favourite cuisines and has been for years. CH even has a joke that I have a “Greek stomach” signifying that when we go out for Greek food, I have a entire other stomach that opens up in order for me to eat more Greek food than CH (it’s true, I do!). CH and I used to go out for Greek food a lot, that was until our favourite place in our hometown changed owners and significantly went downhill from there – we used to talk about having them cater our wedding – that’s how much we loved the restaurant. 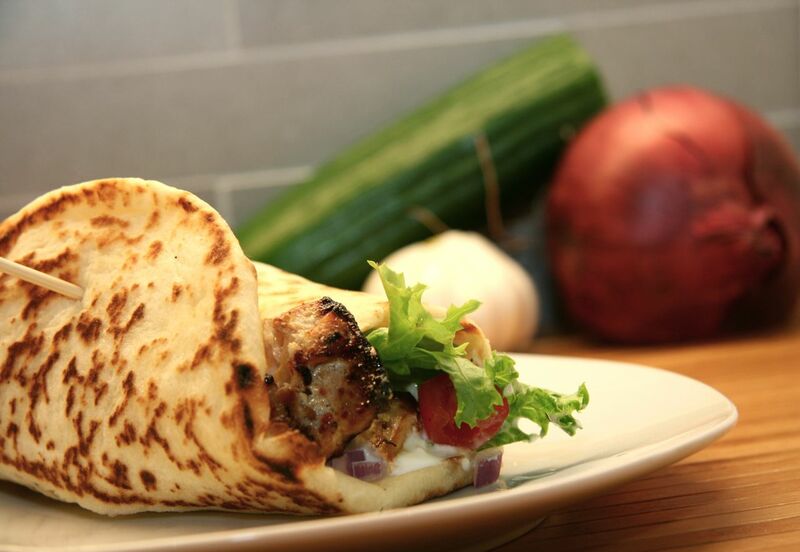 In Toronto there is a huge Greek neighbourhood, and with the exception of one quick (and delicious!) lunch with a friend a few weeks ago, we haven’t explored it yet. That might have to change in the coming days…now that I am writing this. Nonetheless, whenever I get the chance to eat Greek food, I do. So when I had to choose a recipe for this month’s WC recipe swap, I was faced with a challenge. You see, I was given the amazing blog “SO Tasty SO Yummy”, which I have had in my Google Reader since I created an account. Katie is a fantastic cook, a seemingly wonderful Mom to the absolutely cutest little girl, and someone who I’ve enjoyed getting to know over the past while through our cooking board. I seriously have so many recipes starred in my GR from her, that I couldn’t choose: Drunken Noodles, Potatoes Daphinois, Beef Tenderloin in Red Wine Sauce, I could go on, or you could just go check-out her blog and see what I am talking about :)!. So, I decided to challenge myself – Katie claimed she found the Naan recipe that trumped buying it ever again, and we all know that I love homemade goods. I also love Chicken Gyros, another recipe Katie features on her blog, so I decided to combine the two and make not ONE, but TWO of her recipes for the Swap. I personally use Naan a lot more than pita – just the preference around our home. So when the opportunity arose to make it from scratch, I did. That post will be released in a few days. But I had to share the most-deeeelicious chicken marinade I’ve ever had. It knocked my old recipe right out of our apartment window. It is simply delicious, and I will leave it at that. Just try it. Thanks Katie for a great source of inspiration – can’t wait to see what’s next. In a medium sized bowl, whisk together the garlic, lemon juice, vinegar, olive oil, yogurt and oregano. Add the chicken to the bowl and ensure all pieces are evenly covered. Cover with saran and refrigerate for about an hour. Allow the chicken to rest for a few minutes before slicing into strips. Warm your naan/pitas either in the oven, or on grill. 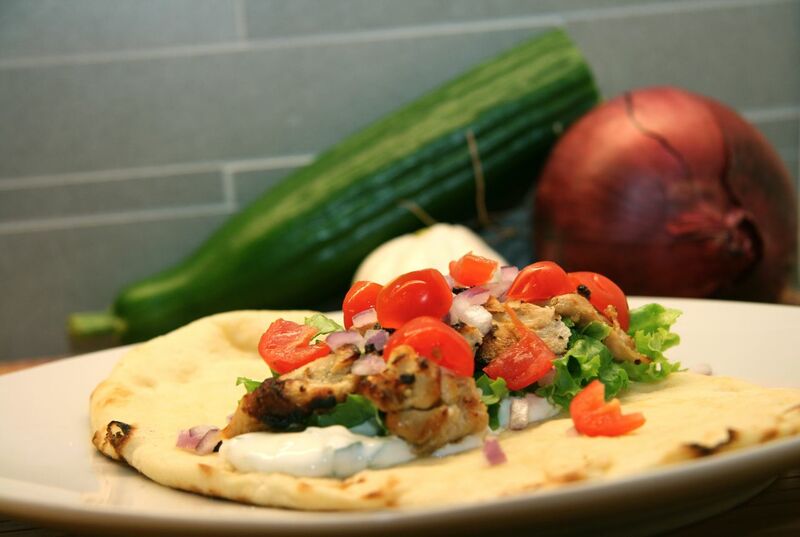 Top the pita with the chicken, tzatziki, tomatoes, onions and lettuce. I am a French-Fry and potato girl. If you dare put a plate of fries down in-front of me, you better believe they will be gone. Instantly. And don’t even ask CH about my “fries-sharing abilities”, they don’t exist. But, every once in a while, I get into a conundrum and cannot decide between fries and onion rings. Usually, fries win. 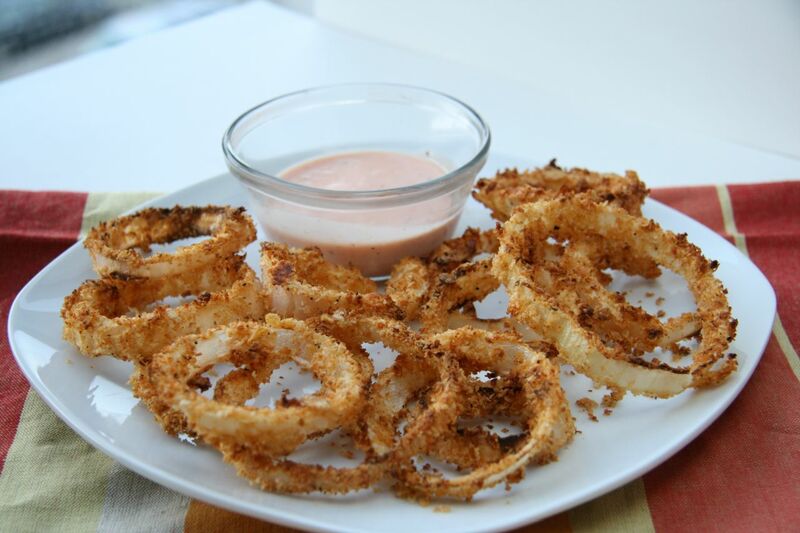 But when the question is asked at home now, onion rings stand a fighting-chance with this recipe. I served this alongside a roast beef dinner last week (with broccoli and mashed sweet potatoes), and they were perfect. 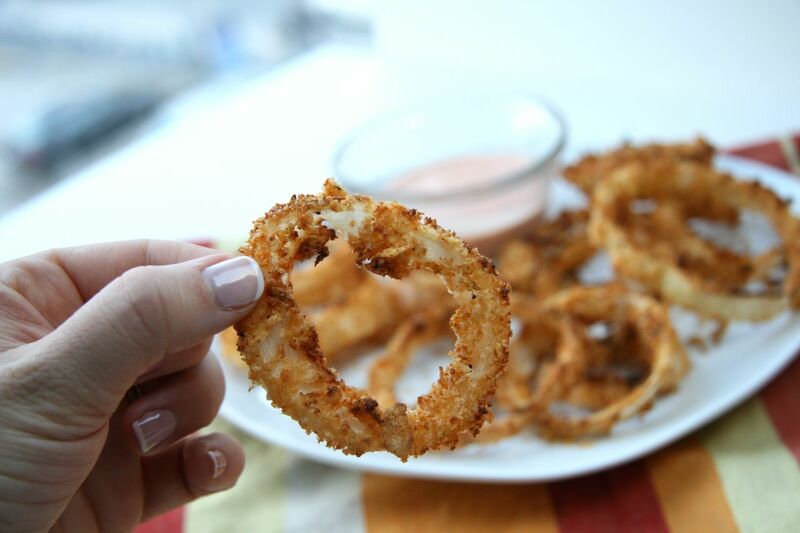 Crispy, golden and healthy onion rings – yes please. The trick, which I have come across in many recipes (and featured in Cook’s Illustrated) is the use of potato chips. Yes, you heard that right…potato chips (and anything with potato chips in the recipe is a winner for me, just so we are clear!). They take a few minutes to assemble, but I enjoyed the process, and the result, is even better. Ps – A recommendation – go visit PreventionRD‘s blog. She features amazing recipes, with a focus on health. One of my personal favorite blogs – so go show her some love. Yield: 4 servings (about 12 rings each). Slice onions into 1/2-inch thick rings. Season the onion rings with salt and pepper. In a food processor, pulse together the panko and chips and transfer to a shallow dish. Season with salt, pepper, and paprika. Place the flour in a second shallow dish. In a third shallow dish, whisk together the egg and buttermilk. Line a baking sheet with aluminum foil and place a wire rack on top. Spray the wire rack with non-stick spray. Dip each onion ring in flour, then the egg/buttermilk mixture, and lastly in the chips/panko to coat. Continue this process with each of the onion rings and place on the wire rack. I have a confession – I’m not good with preparing breakfast (and I think I may have admitted that before!) Yes, I love egg mcmuffins, but you have to be somewhat organized to make these during the week. CH is even worse, usually because he is up way later than me working, and leaves the house many days before I am out of bed. He needs something he can grab as he heads out the door and eat as he is walking to work. Weekends see a lot more breakfast action, but that is because there is no getting up early, when you’ve gone to bed late. But this breakfast is a game changer – it’s quick and easy to prepare, it stays fresh and delicious for days and the best part – it’s HEALTHY. It started out as a healthy recipe from Cate’s World Kitchen (which is a fabulous blog featuring many vegetarian and health-happy recipes), but I tweaked it a little further, and it’s now perfect for our household. 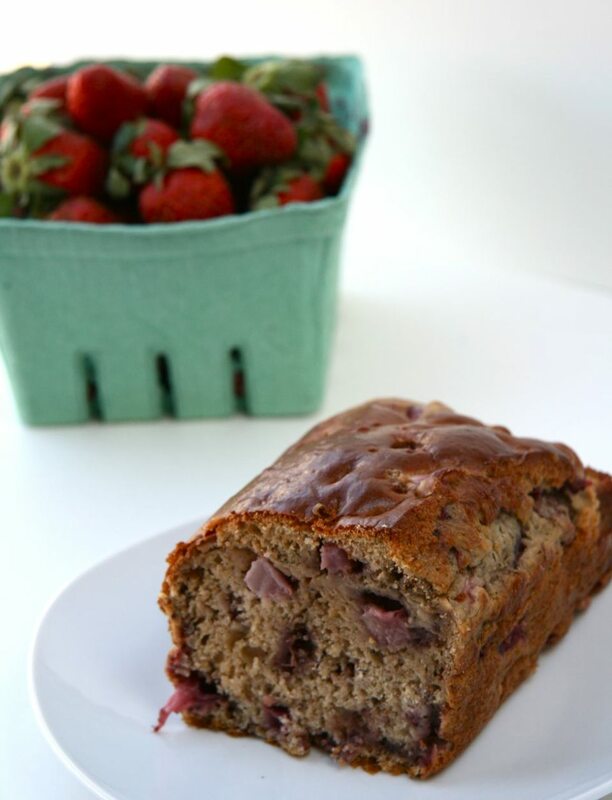 Fresh strawberries, banana, yogurt and applesauce are the main ingredients…all baked together to create a healthy, breakfast bread that keeps you satisfied for hours. 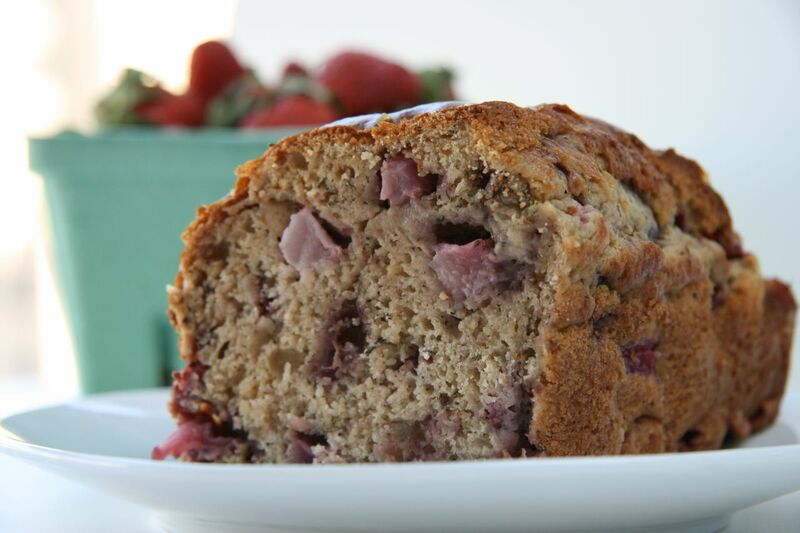 It isn’t overly sweet and you definitely feel healthy indulging in this recipe. CH often steals the last piece, and always has one-extra piece because it is “so good for him”. Give it a try and I hope you enjoy! Preheat oven to 350 F and grease an 8 x 4″ loaf pan. In a small mixing bowl, combine the eggs, yogurt, applesauce, mashed banana and vanilla. Whisk lightly until combined. In a large mixing bowl, combine the flour, sugar, baking soda, baking powder and salt. Stir to combine. Add the wet ingredients to the dry ingredients and mix gently until well combined, and no traces of flour. Pour the mixture into the greased loaf pan. Tap the loaf pan on the counter, gently, 4 to 5 times to release the air-bubbles (this is an important step to prevent an un-even bread). Bake for 35-40 minutes, or until a tooth-pick comes out clean. Remove from the oven and allow it to cool in the pan for 10 minutes, then run a sharp knife around the bread and turn out onto a wire rack to cool completely before slicing. (Store in an air-tight container for freshness).